This is a big weekend. Epcot 30th merchandise today with the celebration on Monday. Food and Wine Festival just begun. And Saturday night, the big Tower of Terror 10 Miler. Now I just began my Disney running career this past January with the WDW Half Marathon, but these medals are sure good enough motivation to keep on going. 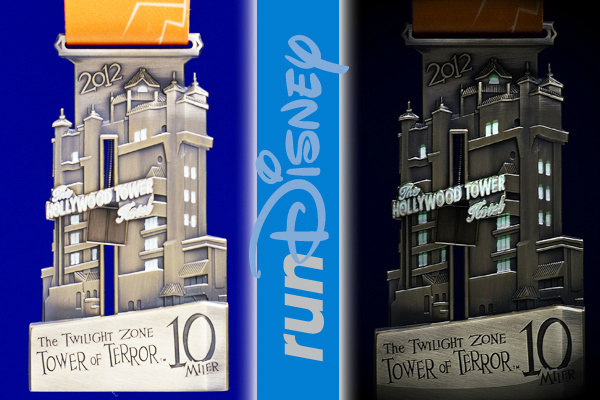 This race gives finishers a replica of the Hollywood Tower Hotel with moving elevator and glow in the dark elements. I had to abstain from chowing down at the Food and Wine Festival today, which was hard since I had to stop by to grab my Epcot 30th stuff and Tony Vinylmation. But you can bet I’ll be attacking those stands Sunday as I walk around the park proudly wearing my medal. I want to say good luck to everyone out there participating in this weekend’s race including our friend Matt over at Vinylmation Kingdom and my Once Upon a Pin co-host Rapinzel. We still couldn’t convince MC to run… maybe next year. Tremendous. Thank you for posting this. I will definitely check to your site to see what’s new and recommend my acquaintenances about this website.